A true story of an IRA informant who battles his inner conflict between conscience and country makes for a decent and mildly absorbing character-based spy games thriller. 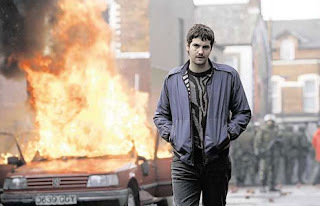 Jim Sturgess, plays Martin, a low level street hustler in Belfast who witnesses both sides of horror in the brutal terrorism activities in Northern Ireland in the 80's. When he witnesses the brother of his girlfriend get shot up by his own IRA compatriots he decides to take a stand against the organization's violent tactics. When he’s recruited into the IRA as a driver, the British government seize on the opportunity to make him an informant of the British. And so, Martin enters the dangerous world of double-agent espionage. But Martin is also a family man with a wife and child whom he must protect against the reprocussions of his actions. He is also forced to put his trust in his British agent, Fergus (Ben Kingsley) who sticks his own neck out to ensure Martin's identity is protected. When Martin finds himself an expendible asset, he suddenly becomes a target. Writer/Director Kari Skogland is clear to tell us who the characters are with on screen text credits, and healthy doses of television stock footage. It all seems more an expression of cinematic tone than necessary information. The plot and character struggles are quite simple enough to follow even when I could only understand half the dialogue. The Irish accents are laid on thick – perhaps overcompensated by the lead non-Irish actors. Kevin Zegers, a Canadian, is believable as Martin's best pal whom he has to betray in favour of his personal scruples. It’s a underwritten role which Zegers makes the best with his strong screen presence. Jim Sturgess, whom I always thought was too pretty for a leading man, scuffs himself up inhabiting the skin of the rough and rumble Irish lad admirably. Skogland at times over directs him at the beginning, concertly trying to convince us that Martin is a hot headed spark plug, with some forced confrontations and overly aggressive behaviour. Skogland's self-conscious handheld action camerawork feels more than a stylistic crutch than a natural transition from her locked down dialogue scenes. For better or worse, the film stands on the side of the British policing activities depicting the Irish fighters as ruthless evil-doers. It’s a new point of view to take, considering cinema has usually dramatized the IRA as courageous freedom fighters. Ben Kingsley is the key to the film – like Zegers, his role is underwritten, but made it’s best with Kingsley reading his lines, as usual, with utmost conviction and belieabilty. If only he was sporting the atrocious hair piece. Informant movies make for great drama – playing both sides of war produces wonderful inner conflict and set piece of suspense and tension. “Fifty Dead Men Walking” doesn’t aspire to be “The Departed”, but a streamlined single character version anchored by relatable real life political situations. Enjoy. Speaking of the accent, I felt like a Frenchman watching a Quebecker film without subtitles. Other than that, although I only understood half of the dialogues, I still felt that the movie was appreciable. This is due to the fact that the plot was easy to follow (and didn't require too much knowledge on Irish history) and that most of the events shown in the film speak for themselves. I am an American who lived in northern Ireland for a number of years. Watched this movie and was amazed to find that the main actors were British, not Irish. Perhaps they hung up a No Irish Need Apply sign. More probably though, No Irish Would Apply, given the blatant bias of this movie. Reminded me of those movie in the US that had non Indians playing the part of Indians. Liam Neeson is from this part of the world. You do not need to be an Irish Republican to get this point. For the record, I am an Irish Republican, of the Bernadette Devil variety. I oppose the armed conflict but understand 100% why people chose that path and like former MP Bernie Devlin would never condemn those who did so.